In the field of synthesis of transition metal complexes, ligand offers the means to control structural variations, which is intimately linked to its properties. 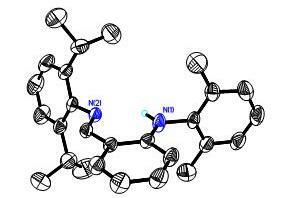 Design and develop of new ligand is the goal of synthesis of transition metal complexes. The anilido-imine ligand that combine the attributions of the ?-diketiminato and salicylaldiminate ligand frameworks can be easily modified from electronic and steric effects by varying the substituents on the aryl moiety. This review summarizes recent developments in this rapidly growing research area at the synthesis of complexes bearing anilido-imine ligands and their applications. Special emphasis is placed on the synthesis and structure of complexes bearing anilido-imine ligands, important achievements with respect to ligand and catalyst design are also highlighted.